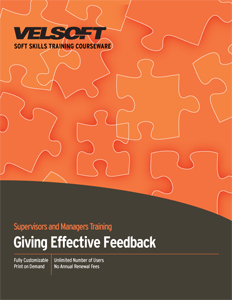 Effective Feedback Training Materials are designed for trainers to develop supervisors’ and managers’ ability to provide feedback to their employees. Teach management when feedback is needed, how to develop communication strategies, the six characteristics of effective feedback and more! Seeing is Believing This sample manual to teach Giving Effective Feedback is in MS Word format. Some of us are not naturally talented when it comes to giving feedback, but this course will help managers to do so professionally. Whether supervisors need training to be able to deliver formal performance reviews, or they need some finesse when delivering informal feedback. Effective Feedback Training Materials is an amazing one-day workshop which covers all the basics. This course covers how to leverage the benefits of open questions, active listening, applying a feedback framework, using six characteristics of delivering effective feedback, and setting up the feedback meeting. This course ensures that your students have access to pertinent, engaging material. Our training materials are designed to provide trainers with everything you need to deliver a practical and rich workshop with an interactive, adult centered experience. Instructor and student guides, a quick reference guide, preformatted PowerPoint slides, a pre-assignment, and pre and post assessments, are all included and customizable. With options to integrate your training with blended learning, your workshops will be leading edge.